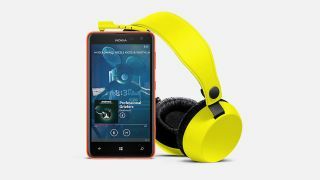 Nokia hopes to tempt the cash-strapped over to the big-screen fast-4G dark side with its latest handset, the Nokia Lumia 625. But can a 4.7-inch screen with a little price win the TechRadar team over? Has Nokia compromised on other specs too much? Check out our thoughts, complete with knee-jerk scores out of five below. It's an uninspiring phone, there's no doubt about that. It's basically a large screen that offers cheaper 4G, but do people really care enough about having 4G speeds while maintaining frugality? No, is the answer. They get a better phone overall. Nokia's Lumia range is expanding to the point of real confusion, and this is just another facet to that portfolio. It's like the Finnish firm is trying out every combination of phone before deciding on the bits that fit. It's a nice handset, and the screen isn't that pixelated, but in truth the Lumia 625 seems a bit of an oddity in an already well-served area. It's no surprise Nokia has launched the low-cost Lumia 625. Just take a look at the Lumia 520 - it's the baby of the Windows Phone 8 line up and possibly the Finnish firm's best selling handset, so there's clearly a market for cheap Windows devices. A 4.7-inch display at an affordable price point will pique the interest of many who can't afford the lofty prices of the flagship phones and with the inclusion of 4G the Lumia 625 does have some strong features. But its WVGA resolution isn't going to be overly crisp and I really worry about a poor visual experience, which could detract from what could potentially be a half decent smartphone. The Nokia 625 proves that big doesn't necessarily mean better. It may have the largest screen of a Nokia to date at 4.7 inches, but with a resolution of just 800 x 400 there will definitely be pixelation problems. And then there is the inclusion of 4G. Yes, it is great to see this speedy technology trickling down into the budget end but in this instance it feels a bit like strapping a Ferrari engine to a Skoda chassis. You pay peanuts, you get monkeys. I get it, I do. Some people can't afford the top end phones but still want the big screen, the 4G, the whole smartphone shebang. And it's cool that there's an option for them. But what's the point of a massive screen if the quality is going to be all pixelly and gross? WVGA? What is this, 2011? It's like picking up a no-brand TV for what seems like a song in the supermarket - in the long-run, the frustrations will outweigh the cash you saved then spent on chorizo. And by the middle of your contract, that chorizo will be long gone. Get something smaller that'll last you two years, that's what I say. The orange one looks pretty cool though. Why would anyone buy this phone? That's a question we're unlikely to find an answer to anytime soon. I'm all-for the big screens – I screamed the praises of the Samsung Galaxy Note while it was still being derided as "ridiculous," "too big" and "WTF" by many people who have since been educated at phablet-point. But Nokia's strategy for making a big screen with the 625 is not 'pack in the pixels' but instead 'make the pixels bigger' which is just plain wrong. How many variants of Lumia can Nokia pump out? I like them, but I am now totally and utterly confused by the plethora of options available - I count 12 in total on the Nokia site and then there are yet more options with all the bright colours and everything. If I'm confused, why shouldn't you be? I get that this model has a big screen, but lower cost. But as such it's a bit of an oddity. Nokia is trying to sell it on the big screen, Smart Camera tech and Full HD video: all stuff that begs for a decent display. But the screen has a poor WVGA 800 x 480 resolution, so I reckon the experience will be pretty shocking. And at a time when high end Lumias are available on some pretty good contracts, I just don't see much point in the 625. It's a really interesting move from Nokia to try to attract people who don't want budget to equate to small. Interesting, but I think probably flawed thinking. Having 4G is great but the phone doesn't look powerful enough to really take advantage of it (and you'll fork out loads for a 4G plan - hardly budget) and, like the Nintendo 3DS XL, bigger screens that don't up the resolution just end up with a shoddy user experience. I'm not convinced. It feels like Nokia risks spreading itself thin right now by trying to hit every price point. Sure, the Lumia 625 has a nice pitch: a 4G device for the masses. I'm not bashing the idea. But 4G and a fancy rainbow of colour options are only distracting from an otherwise disappointing handset. 512MB of RAM isn't going to get anyone excited. Feels like one for the 4G keen beans: those actually looking for a decently powerful phone will probably want to keep searching. Want more, more, more from the TechRadar team? And did the HTC One Mini fare any better?